Transition area: Open from 6:00 – 7:30 am on Sunday morning. Mandatory pre-race meeting: At the swim start area at 7:45 am. Not sure how to start training for a triathlon? Click on the link below and follow our 8 week Triathlon training program. The program will begin in May and continue through July 13 with the last day being the day of our Triathlon (July 14)! Wetsuits will not be allowed if the water temperature is above 78 degrees on race day. 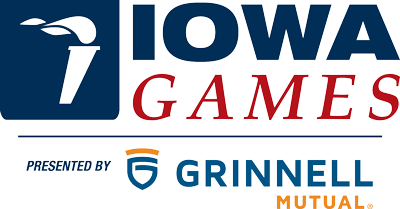 The Iowa Games and Iowa Senior Games have partnered to offer athletes ages 50 & over a unique opportunity. When you register for the Summer Iowa Games triathlon, you will automatically be included in the Iowa Senior Games. In addition to the Iowa Games T-shirt, athletes will receive an Iowa Senior Games t-shirt and an Iowa Senior Games medal (top 3 places per age division only). If you wish to participate in additional Iowa Senior Games sports, contact the Iowa Senior Games for how to register. Athletes will receive a dri-fit shirt. Gold, silver and bronze medals awarded in each age division. True Time Racing Service will chip time the event. Chips will be distributed with packets. This event would not be possible without volunteers. If you would like to be part of the action, numerous volunteers are needed for this event. For more information on volunteering, click “Volunteer Opportunities” in the drop down menu or click the button in the top right corner of the page. Please contact Dan Beitelspacher at dan.beitelspacher@iowasportsfoundation.org, to learn more about volunteering or if you have questions. The Iowa Games Triathlon would not be possible without our volunteers. To volunteer, click HERE. Registration opens March 1. Location information can be found on the General Information tab. Parking is free. All volunteers will receive a Summer Iowa Games Volunteer shirt. Volunteers will check in at the packet pick shelter where you’ll receive your shirt and further instructions. If you have questions about volunteering, contact Dan Beitelspacher at dan.beitelspacher@iowasportsfoundation.org or call 888-777-8881. Job duties – handout race packets & t-shirts to participants, stuffing race packets with materials, etc. This packet pick-up will be held at Exile Brewery. Please see the events page for address. Job duties: count swimmers as they exit the water to make sure all are accounted for. Job duties: help direct participants and assist with other needs along the course. Job duties: help athletes get water, may need to direct athletes as they approach if there are multiple. Onsite entries NOT guaranteed Dri-Fit Shirt.